The Holy Grail finally? For 5 years, most fanless mini PCs from all major brands bombed systematically, and we firmly believe that poor cooling is to blame. MSI is teasing the Cubi 3 Silent and Cubi 3 Silent S in what looks like a prematurely released video, and for the very first time cooling is the main attraction. Granted, natural convection is still obstructed but such large heat sink is a step in the right direction. The small barebones are powered by 15W Kaby Lake processors. 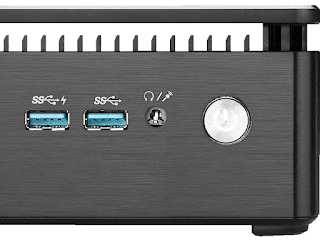 Update: The consumer-oriented Cubi 3 Silent features two DDR4 2133MHz slots (up to 32GB), M.2 and 2.5" bays, four USB 3.1 ports, and LAN, while the professional-oriented Cubi 3 Silent S adds two USB 3.1 ports, two COM ports, and an additional Ethernet port to the mix. We're hearing that three CPU options will be available: i3-7100U, i5-7200U, and i7-7500U.